Chinook Salmon 2 per day [over 45cm 18”] opening July 15 to Dec. 31, 2019. Limit of 10 a year. Coho: 2 hatchery per day and on Sept. 5/17 4 per day in area 20-2 of which 2 can be wild. Nitinat area 22 you may retain two (2) Coho per day (hatchery marked or unmarked). Rockfish: 3 per day of which only one can be Quillback, Tiger or a China Rockfish. 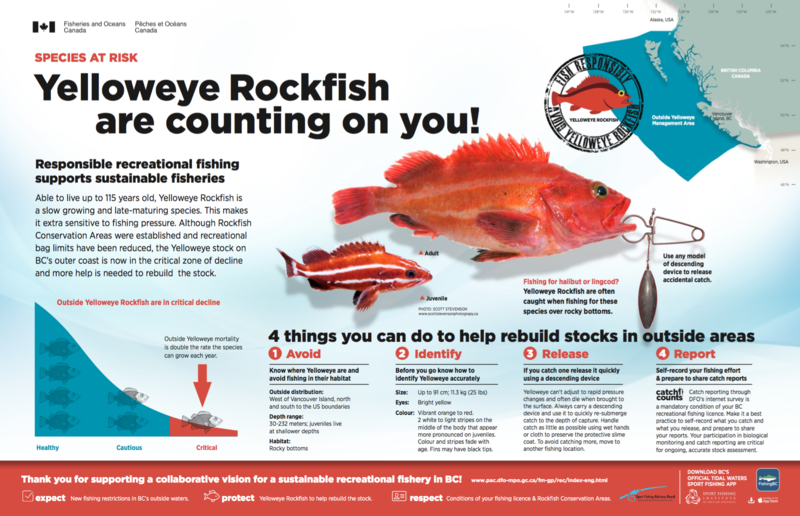 No retention of Yelloweye and Bocaccio Rockfish. Codfish: 8 per day Species includes: Pacific cod, Pacific tomcod, pollock, and hake but does not include lingcod. Halibut: Daily limit of 1 per day and option of 1 halibut no larger than 126 cm [about 60 lbs] for possession limit or 2 halibut under 90 cm [about 20lbs.] for possession limit. Annual limit is 6 per year and they must be recorded on your licence. Starts in June and tapers off toward the end of September. July, August & September are the best month for these salmon. Found in the San Juan River, Gordon River and Harris Creek all year round. Lizard Lake and Ferry Lake produce cut throat trout as well. Plentiful in the bay during May, June & July. Fishing for bottom fish usually starts in April depending on the weather and water conditions. Swiftsure bank is the favourite spot for halibut and is about 20 miles from Port Renfrew, although halibut, lingcod and rockfish are taken along the coastline as well. Best in the summer months on the beach just down the road from our property. If you don’t have the essentials to head out on your own, there are plenty of fishing charter companies in Port Renfrew that would love to take you out. Please contact us for a referral.